We have developed two new high power grow lights of 50 and 100 watt, replacing our previous 30 and 60 watt lights. This light is the larger of the two new models, being of the same design as our 50 Watt model with the difference being that its larget to make room for the dual COBs and although the high high power output the housing construction is still fan-less and completely silent during operation. While developing of these new grow light we have focused on improving several things. The most obvious improvement is that the new model now outputs 40% more light compared to the previous model but can still be kept at the same price point. This has been partially achieved due to closer relations with individual factories while also moving parts of production home to Sweden allowing us to further improve product quality control. We no longer use individual LED chips spread out over a large PCB area where every color/wavelength of light can be seen separately when looking at the lamp but instead we now use COB (chip on board). By switching to COB the grow light gives the impression of looking like a “regular” light as individual wavelengths can no longer be seen. COB differ in that all LED chips are mounted on a small circuit board, covering a small surface area. This allow all light to pass through one and the same lens, minimizing glare while blending all the optimized wavelengths to produce a uniform warm light suitable for any indoor condition and plant. We understand the importance of both design and comfort and pay big attention to both the wavelengths and the ratio used so our products naturally can fit into any living or work area. By switching to COB, all of the LED electronics inside the housing are produced by machine. This means higher quality and reliability with better precision as there is little to no room for human errors during the manufacturing process. We have designed our COB with an energy consumption of 50 watts although the COB holds twice the amount of LED chips what is needed. By constructing the circuit as such, we can reduce the energy consumption for each LED chip thereby extending the life expectancy of our COB. Further, we have extended the functionality of our new circuit boards as they now will allow for dimming though any external dimmer. The grow light is IP65 rated and can be used indoors as well as outdoors or in greenhouses and has optional length power cord length of 1, 3 and 5 meters. In addition to being a fan-less and noiseless, passive grow light we now use borosilicate glass-lenses which are not prone to damage such as warping or discoloration as with plastic, which does lead to reduced light throughput over time. 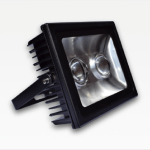 Both this new 100w and 50w models use these types of glass lenses with a 90 degree beam angle which ensures good coverage and maintains its light throughput capacity over time. We use our own spectrum and ratio for all our grow lights where the main difference between our grow lights and regular grow lights is our philosophy that they should not only be effective for plants, but must also be pleasant to be around. Our lights are thus suitable for growing any type of plant, both tropical and non-tropical as well can be used indoors or in working environments together with plants without being perceived as offensive as we use a full spectrum comparable with warm light and not only red and blue LEDs as you normally find in grow lights today. Our full spectrum light is optimized for both chlorophyll development and flowering and by combining other specific wavelengths we also take other plants pigments into account besides chlorophyll. This refers to pigments that produce colors other than green in plants (caratenoids, anthocyanins and flavanoids), which is extremely important when growing flowers or fruit. These pigments are not only important for color development in plants but have an equally significant role in flavor and odor development. By combining these colors in a unique way we have achieved a natural color ratio between optimal wavelengths that give rise to a superb reflection of colors for leaves, flowers and fruit. Plants do not just thrive under our light but also look beautiful, a must for any indoor condition where high comfort is prioritized and differs from regular grow lights where the light color is usually purple or red. This grow light puts out a decent amount of light and is suitable for all type of plants, both tropical and non tropical and can be used for any stage of a plants growth such as sowing seeds, propagating and flowering but can just as well be used for all types of indoor plants and trees to keep them alive and well all year around. The proper mounting distance is between 1 to 3 meters above the surface or floor on which plants are placed to give a good light coverage. None. Cable with optional length.